I.o.w: no "piece of art". Some z-axis or vertical action this time. the golden "cogwheel" at the bottom is a "kicker". For those of you who aren�t familliar with "funnel-maps"
all playerstarts are clamped into one small space. 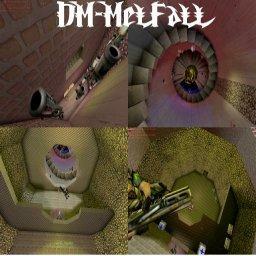 (You can play these kinds of maps at: "Leifis Funnel server" or "MELSOFT SMALL FAST CUSTOM maps"
What was it like? One playerstart and a redeemer? Anyways, his maps might be awfull, but let's keep it clean and be polite. Mell never went to far, verbally, so neither should we IMO. He hasn't said anything offensive so don't provoce it. There are enough flamers around so let's not try to get more of them. Sorry I forgot to write a description when submitting the map. I�ve been asked to put this map on the net and the best place for downloding UT-maps is still NC3. Since people at NC3 keeps telling me my reputation as mapper is f**ked, I might as well upload "CTF-MellGlobe". I second Xepptizz comment,my thought exactly. But this time i am going to try this map,it better not be one player start in ther.or i will post a zero. OK map is not a zero,he made it to at least see ware your at via colored light,and I can see the squirmish for a quik blast of fragging,but nothing else. It should of been a little wider,even for this type of game-map.sorry mel,but a 1.5 is all i can muster. EDIT Here is the perfect exmple,I put out quake1 dups wich took me forever to do ,and all you pro mappers shoulda been awed to some extent,he puts out maps wich I don't dig ,graphics and or gameplay,however I can respect WTF he's doing. The problem, Mellburn, is that you do not listen. We are not criticising the fact that you keep making maps, it's the fact that you won't listen. People have told you countless times to read some tutorials on how to map more effectively, you obviously weren't taking anything in. Nobody will ever download and play your maps because of the reputation that you have earned. I can only wish you luck for the future. Whisper: The reason we comment on them IS to save people time, by not downloading them. ;) I do see your point, but there is also nothing stopping the mapper from stating that is is a specific map designed for a certain type of player, et cetera. Fabaa: The reason that we download it, despite it's game type, is that that's the reason we're here; to provide feedback on maps. We look at a map from a build point of view. If the map is bady built, people will say so and hopefully provide constructive criticism so the author may improve. If it's good, people will say so. It has nothing to do with the author or the game type. The reason this map has received a load of rubbish scores is that it is a badly constructed map. seriously MelBurn, think about what i said in your other map thread. i gave you some feedback, and how to make a better map. i see you took the step forward to more z-axis fighting, but this is crazy. you should look at some maps like DM-Gothic, DM-Curse2, DM-Deck16 and what not for more mapping inspiration. you have potential as a mapper, i know it, but you donot show it in your work. i have played this map, but i am not going to rate it. personally, i think you make these maps just to make people give them bad ratings, which means you dont try. What XepptizZ said.... and more redeemers! Why is it a map like this gets a bunch of comments when just from the SS you can see its no "EPIC" map. I uploaded a map a day or two before this one, thats actually a pretty decent normal UT map, and I get half the comments, isnt it time you people start making comments to mappers who actually try to make a good map for your playing pleasure. Indy out:) PEACE. EDIT: Well I finally tried this map out and I must say I dont like the style of gameplay here, its many you fall get deemers and rule, this style reminds me of playing fractal reactor on cincciRR with 24 players, its nothing but a spamming frag fest, the good thing is thats what the author was going for I belive, I think the build is very weak tho and the map could be made much beter looking, even tho it would'nt change the final outcome of the gameplay, it seems to be very tight but even making it larger in width it would still be a spam fest, but it does what he says it should and thats what really counts. Why you don't try to learn it from the retail maps? Det finns b�ttre s�tt att anv�nda sin h�gerarm till att avreagera sig med �n att skriva dumma kommentarer i stora bokst�ver. Du borde ge det ett f�rs�k, ifall du har �ldern inne dvs. I'm not a fan of funnel-maps either, and I don't play it, so I removed my 0-rating. I don't see any reason to bring up a flaming discussion everytime a map like this shows up, so I'll just out and let people who like this kind of maps play them. Mel obviously wants to make maps the way he likes them - although it may not be your style. Flaming him and rambling on about how he isn't 'learning' actually says a lot about you as a person. Take the hint, if he wanted to make the traditional style of map he would have done it already - if you don't like his maps just move on and stop wasting everyone's time. I was reading the comments on Mellburn�s maps so far with mild curiosity and finally decided to see for myself what all the fuss was about and boy � what a mistake it was. I was expecting something bad but actually it was worse than expected. Half point because it loaded successfully. [TO PEOPLE] - READ THE DESCRIPTION - Its a FUNNEL map - (whatever that is).So Mel likes to play funnel maps,and even author a few of them. Maybe next he'll make a spoon map or a fork or a seive. If you don't like the gameplay of funnel maps why dl it? [TO Mel] - your map is b*&!t ugly! maybe you thought no one would warm up to the idea of a 'funnel' map, some of us did!! At least do the basics right - source the lights and do some decent texturing. Nytehawk said: Nobody will ever download and play your maps because of the reputation that you have earned. MelFunnels are on pretty every funnel server no matter if AAA Leifi HighVoltage Explosive Playhouse or Truff. I liked some of the steep styled ones he did (Melfunnel-Style) and most of his stuff gets my preference over Voxel*s style or those gits of KLM who just bump their tag at a wall claiming even to have wiped up Deck16 and Crane eh. Plus Mel's Texturing is actually better as the others all stick to Voxels example of a single texture from UTcrypt2. There were some guys seriously telling me my HexPlatfoams was dull (LowGrav Map that emulates GMC settings on a reg server by using U4). They midgame voted for MannyFunnel saying that one is better. (!) You just can*t compare reg UT to Funnels and the people on a funnel server will refuse to play Deck no matter it be the worlds most famous Unreal map or not (yep never forget it is from Unreal not UT). 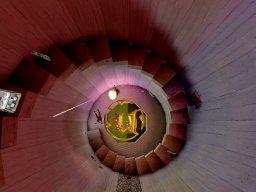 Remember funnels are fun-tunnels and maps you play in a break for a chill you also make in a break. Guys that make them don*t need to learn more mapping than they need to fulfil their sole interest of making funnels, or do you study how to fly a plane to just fly with it into vacation?! :/ Whisper is right when saying Mel*s creating the maps he likes and I find every map is quite done other way than b4 (except those he assembled from another game, no good move dude ;)). For years, people also like to diss my stuff saying there gotta be obstacles and walkways in my arenas as I prefer arenas for Bin and ESR, tho me keeps on telling them I for my part play mostly GMC settings, mostly even spiced with U4, so how the hell should I play fuzzy narrow minimaps like a 1024 UU ceiling in Deck16 or Liandri then? The GMC was such a big part of the US UT scene, in your opinion I suppose they were all wrong? I thought Nalicity was for all types of UT players but it seems the common Euro gameplay style tries to prevail? :( Then again, funnel scene is biggest in Netherlands, which is Europe. You got to think everyone has the right to play UT the way he/she likes, Reg, Bin or ESR, I would not either begin to map stuff sized for reg settings (like Deck16 alikes) that no one of my clan can play just to earn acknowledgements from people that play reg settings. nice funnel map - plays well enough, and isn't easily dominated. @ Corey(:K256:) make a map yourself!!! - you downrater. @ Pomperi - I hear you. I can respect the people who like this style of gameplay, though I loathe it, but come on, at least TRY and make the map not look awful. There is no excuse for ugly mapping. @knulla: If you like funnel-maps, that's your problem. If you rate down other maps, that's also your problem, because noone will give a damn about your ratings or comments. But DON'T tell others to "make a better map" than this crap. Look at Corey's profile, he has made a map. The rating shows it's obviously not perfect, but I only have to look at the screenshot to tell it is way better than THAT! Ok so i finally had to join nc3 just to post a comment. I have been playing ut for a few years now and i play all game types both on and offline. I regularly come here for new maps and i try nearly every single one that i see appear in the three lists at the top. My favourite servers are sniper and funnel map servers so i get a lot of there maps here. But im puzzled over why the same people call hell out of the author, why call each and every map he releases just cause you dont like/prolly can't play his style of game. You really cant seem to be able to grasp the fact that there is a community that enjoys these maps and we dont want to see fancy arsed lighting and pretty textures with little bits off decoration here and there. We want a quickly knocked up, fast paced, fully loaded with a stupid amount of weapons kind of map and with the least amount off places to run the better. I doubt JonnyMellis will change his style off mapping and i sincerely hope he won't. As for reputation who gives a flying f*ck what other people think off you.